The 2018 Airborne Electromagnetic Survey (AEM) Flights are complete! The Lower Elkhorn NRD and Nemaha NRD chapter reports are now available. You can also click here for an updated location map of the 2018 flights. Be sure to visit our other AEM tabs for additional AEM results and project descriptions. WARNING! A Google Earth Pro update in early 2019 rendered the image links in the older .kmz files inoperable (impacts 2014-2015 AEM flight deliverables only). Please replace any .kmz files you may have downloaded prior to April 2019 from our 2015 AEM and 2014 LENRD AEM website tabs with the current posted versions. Groundwater elevation, weather station data and sampling results for ENWRA's 3 pilot study sites are now available under the Media/Downloads Tab. Click here for a link to download the 2008 to 2018 compiled datasets and graphs (168 MB). ENWRA's Annual Meeting was held January 29, 2019 at the Foundry (14th and P St.) in Lincoln - click here for the minutes. ENWRA's next spring technical committee meeting is planned for June 17, 2019. AEM survey is a very rapid and efficient way of remotely sensing geology across an entire site without engaging in extensive drilling. 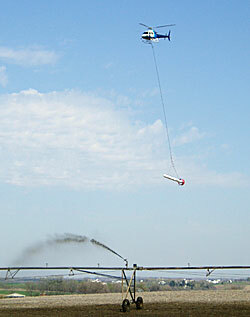 In AEM surveys, a geophysical device (typically bullet or hoop-shaped) containing sensors is suspended beneath an aircraft (can be helicopter or fixed-wing). An electromagnetic field is continuously transmitted to the land surface (and subsurface) while the aircraft is in flight, and the sensors carried under the aircraft receive the subsequent return of electromagnetic energy from the land surface. 2014/2015 AEM results are posted under the 2015 AEM tab and the 2016 AEM results are posted under the 2016 AEM tab. Various technologies were applied to three geologically distinct pilot study sites (Ashland, Oakland, and Firth) to determine the most efficient way to characterize eastern Nebraska’s varied geology. HEM survey (frequency domain electromagnetic geophysical method) was found to provide useful information in two of our three pilot study sites where there was little to moderate thicknesses of glacial till. Lower Platte South and Lower Platte North budgeted $240,000 in 2009 for additional HEM flights outside of the pilot study areas. These areas are of special interest to their Natural Resources Districts because of water quality and quantity issues. The Nebraska Environmental Trust has contributed an additional $200,000 toward processing the data generated by the flights (reports are available for download on Media/Downloads page). In 2013, the Lower Elkhorn and Lower Platte South contracted approximately 190 square miles (combined) of additional AEM flights to learn more about areas in their respective Natural Resource Districts with water quantity issues in the 2012 drought season. Click here for a copy of the Lower Elkhorn report for the Clarkson-Howells area. Click here for a copy of the Lower Platte South AEM report and interactive map for the Dwight-Valparaiso-Brainard survey. ENWRA drilled approximately 40 test holes total across the three pilot study sites. 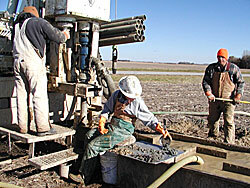 The test holes provide high-quality geologic data and are required in order to make a direct association between HEM survey results and subsurface geology. Downhole geophysical tools are used to log both electrical resistivity and gamma-ray emissions of the geologic materials encountered in the test holes. Test hole drilling continues today under ENWRA to both ground truth AEM survey areas and provide additional borehole contraint on future AEM data processing. Click here for a link to the University of Nebraska, School of Natural Resources, Conservation and Survey Division's Statewide Test-hole Database. 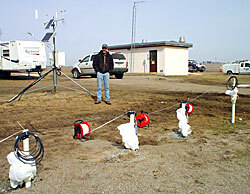 ENWRA uses heat-dissipation sensors, soil moisture probes, and weather stations (air and soil temperature, precipitation, humidity, wind speed, solar radiation, and potential evapotranspiration) to continuously collect data regarding groundwater recharge at each of the pilot study sites. This information contributes to understanding the volume of precipitation recharging the underlying aquifer at a specific site, how fast that recharge occurs, and the importance of vertical and horizontal flow paths. Click here for a link to download ENWRA's recharge station locations and assoicated 2008 to 2016 compiled weather station datasets and graphs (24 MB). ENWRA collects water quality samples at monitoring wells and has the samples analyzed to determine general water chemistry. By comparing water chemistry, hydrogeologists can assess the extent of connection between aquifers and surface water and potential flow paths. In cases where general water chemistry does not provide a clear answer regarding connections, additional ground water samples will be collected and age dated. In addition to providing information about aquifer connections and flow paths, water sampling provides site specific information that will likely be useful in the future for water quality conservation purposes. Click here for a link to download ENWRA's 2008 to 2016 compiled datasets and graphs (168 MB). 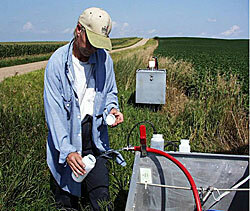 ENWRA conducted two aquifer tests, one near Hickman and another near Oakland. Aquifer tests are performed to assess the aquifer extent, amount of water in storage, the rate of water movement, and its potential hydraulic connection to other aquifers. To perform an aquifer test, hydrogeologists use a high-capacity production well installed in the aquifer they are studying. Observation wells are then installed at selected distances and in different directions outward from this pumping well. 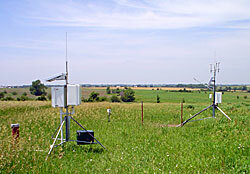 These observation wells are designed to monitor water levels within, above, or below the pumped aquifer. Water is pumped from the production well at a constant rate over a period of multiple days. The amount of water level decline in each observation well (drawdown) provides hydrogeologists with the information they need to estimate the transmissivity and storativity of the aquifer. Changes in the rate of water-level decline allow hydrogeologists to assess flow boundaries and the potential connections between aquifers.